In recent years we have witnessed an increasing convergence of work in International Politics and Performance Studies around the troubled, and often troubling, relationship between politics and aesthetics. 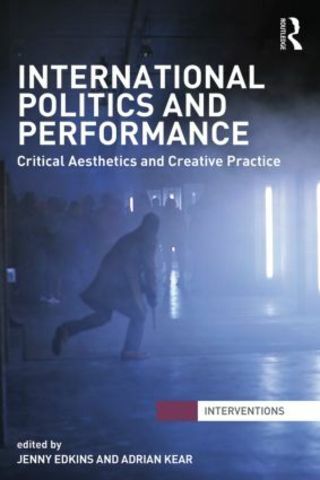 Whilst examination of political aesthetics, aesthetic politics, and politics of aesthetic practice has been central to research in both disciplines for some time, the emergence of a distinctive ‘performative turn’ in International Politics and a critical return to the centrality of politics and the concept of ‘the political’ in Performance Studies highlights the importance of investigating the productivity of bringing the methods and approaches of the two fields of enquiry into dialogue and mutual relation. Exploring a wide range of issues including rioting, youth-driven protests, border security practices and the significance of cultural awareness in war, this text provides an accessible and cutting edge survey of the intersection of international politics and performance examining issues surrounding the politics of appearance, image, event and place; and discusses the development and deployment of innovative critical and creative research methods, from auto-ethnography to site-specific theatre-making, from philosophical aesthetics to the aesthetic thought of new securities scenario-planning. The book’s focus throughout is on the materiality of performance practices—on the politics of making, spectating, and participating in a variety of modes as political actors and audiences—whilst also seeking to explicate the performative dynamics of creative and critical thinking. Structured thematically and framed by a detailed introduction and conclusion, the focus is on producing a dialogue between contributors and providing an essential reference point in this developing field. This work is essential reading for students of politics and performance and will be of great interest to students and scholars of IR, performance studies and cultural studies.